GREENVILLE, Tenn. (MARSHALL) -- They aren’t as popular as they used to be, but occasionally you do still come across an old-timey tent revival here in Tennessee. On a recent summer evening a small congregation in Greenville, Tennessee, gathered under a tent to listen to pastor Shannon Sizemore deliver the first sermon in a week-long revival. Sizemore, despite his inexperience in a revival setting, seemed confident and excited. Tent revivals have been a staple of southern Christianity for over a century. Dr. James Hudnut-Beumler of the Vanderbilt Divinity School researched revivals estensively. He teaches history of religion in Americ and has also written a book about contemporary Christianity in the American South. 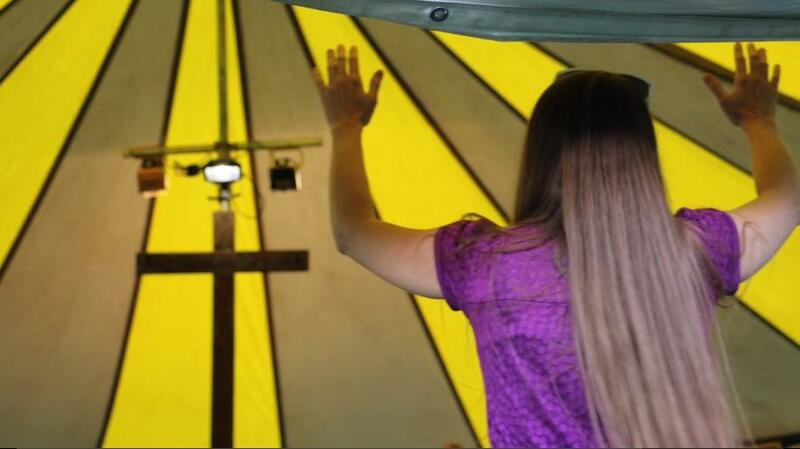 “A tent revival is a short-term opportunity for a congregation to reawaken their spiritual devotion to Christ and invite others to commit their lives to Christ for the first time,” Hudnut-Beumler explained. Hudnut-Beumler said that tent revivals actually derived from a Scots-Irish tradition of holy fairs to prepare people for communion. They were brought to America by immigrants, and evolved into evangelical events, especially popular in the American South. He says they hit their peak between 1890 and 1930. In the 1960’s, when air-conditioning became more widely available in churches, the revivals began to die out. Despite their long history, Hudnut-Beumler said the revivals of today are very similar to those of the early 20th century. “We hear some of the same kinds of preaching, same kinds of singing—there are some new songs—but the old gospel message is still presented in remarkably the same fashion,” he said. Fiery sermons have always been a staple of tent revivals. As an example, Hudnut-Beumler noted that Prohibition Era evangelist Billy Sunday was one of the first tent revivalists to gather a national following. In widely available historic recordings you can hear Pastor Sunday shout "And I'll fight the saloon from up to Hoboken, and I'll kick it as long as I've got a foot, and I'll fight it—I''ll punch it as long as I've got a fist...."
In the era of mega churches with large praise bands, Hudnut Beumler said he doubts that tent revivals will ever return to their former glory. However, he said he does think that they will continue for at least another generation because of their importance to the history of some congregations. But for at least some believers, the best place to hear a gospel sermon is under a tent, on a hot and muggy Tennessee night.